Auburn Career Center is registered for the Ohio Safer Schools Tip Line. "See something, say something or send something." Please take a second to download the app. Auburn is registered with Safer Schools Ohio. Call or text 844-SAFEROH to report anything suspicious or endangering. 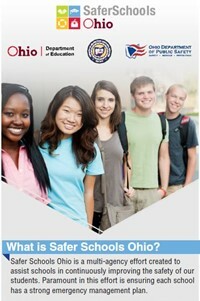 What is Safer Schools Ohio? A safety resource is available to Ohio Schools that could prevent and alert local law enforcement to a school safety crisis. This resource – an anonymous tip line service – is available free of charge to every school district and public and private school in Ohio. The Ohio Department of Education and the Ohio Department of Public Safety launched the SaferOH tip line that will accept both calls and texts 24 hours a day for schools that register for the service. TAP Unit analysts always follow up quickly with the affected school and law enforcement agencies to make sure that the incident is investigated, action is taken and the outcome is tracked. The assurance that their calls or texts cannot be traced and that serious, proper action will be taken to end the threat is helping to persuade young people to take a stand against school violence.